The following is my attempt at an analysis of Israel's motives behind the Gaza massacres. Israel has said that the aim of its military operations in Gaza is to stop Hamas from launching rockets into Southern Israel. It is portrayed as a defensive act framed under "war on terror". Israel say it has tried to target key Hamas installations and infrastructures that enable the rocket attacks. So far, they have air bombed shopping centres, public squares, police stations, residential housings, mosques, universities and schools, and in the process also destroyed more than half of Gaza's ambulances. That in itself shows the difficulty of Israel's attempt in achieving its objective in a place like Gaza: densely populated with little safe haven for civilians to run to when the bombs start falling. The UN has estimated that at least one-third of the casualities so far in Gaza are civilians. With the ground offensive underway, that number will only increase. As an indication of what may come to pass, Human Rights Watch reported that the last time Israeli tanks moved into Gaza, more than half of the Palestinian casualities were civilian. There is no way Israel can limit its damage to Hamas installations or militants without adversely affecting the civilian population, and Israel knows this. Given the extent of the damage from Israel's military actions - the heavy costs bourne by the Gaza civilian population, the media reporting of the casualities that serves only to fuel public shock and anger against Israel's actions, and the eventual detereoration of Israel's public image worldwide, why would Israel even embark on such a mission? It is pure madness on Israel's part? On the contrary, there is method (or a rationale) to this. Israel's military incursion is part of a broader plan to enforce a peace on its own terms. Yes, Israel is after peace (it needs peace), but it is after a peace that is established on its own terms. However, Israel cannot achieve what it wants through an agreement with Hamas. 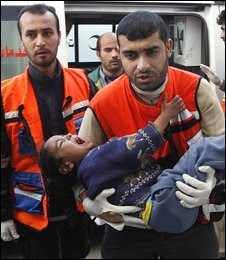 Ever since Hamas was democratically elected by the Gaza people in 2006, it has been a constant thorn at Israel's side. Efforts to stymie Hamas' ability to govern under the mandate of the Gaza people had the effect of strengthening its appeal. Despite what Israel did (essentially turning Gaza into a prison camp through illegal blockades - Gazans had no control over its own borders - land, air and sea, and were reduced to begging for food, medicine and fuel) Hamas only grew stronger in Gaza, and this weakened the only other party in Gaza that Israel could negotiate with. Negotiating with Hamas would have been unthinkable for Israel - not because of the rocket attacks, nor because Hamas was deemed a "terrorist group" (afterall history has shown that Israel negotiated with the formerly labelled terrorist group, PLO) but because it would have been perceived by people (especially Arab people) as having been forced by Hamas' militant stance. And that would not have bode well for Israel's future security - a country surrounded by a sea of Arab neighbors. Already Israel believes that the net effect of Israel's pull-out from Lebanon in 2006 was to embolden Hamas who had hoped to emulate Hezbollah's achievements in that regard. 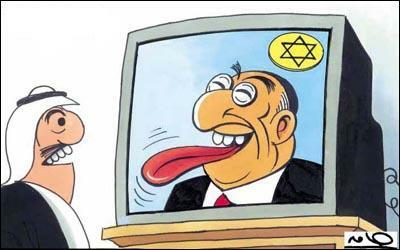 Israel was widely perceived to have lost its teeth - and indeed the defeat in Lebanon showed the limits to the Israeli military. Compound that perception with the rise of Hamas in Gaza, who had effectively solidified its position in the past two years. The Israeli military operations then aim to accomplish three objectives (1) the forcible weakening (or removal) of Hamas (2) demonstrating the might of the Israeli military (3) re-establishing Israel's deterrent power by signaling to Arab nations that Israel can act militarily under the frame of defense (or war on terror) if it chooses to, and it will not be reined in by the world. How can Israel benefit from achieving the objectives above? Firstly, it re-establishes Israel to a position of power. Second, peace or cease-fire negotiations with the remmants of Hamas (whoever is left standing after the war) and the PA in West Bank would now be acceptable to Israel since it would be stemming from its renewed position of power, and also because Hamas would not be in a position to dictate terms, weakened as it is. The underlying assumption would be that the civilian population would be war-weary enough to support opportunities for peace, even if under terms that are undesirable. Already efforts are underway to turn the Gaza civilian population against Hamas - recordings, such as this one as reported on CNN, are played in phone calls to Gaza civilians:"Urgent message, warning to the citizens of Gaza. Hamas is using you as human shields. Do not listen to them. Hamas has abandoned you and are hiding in their shelters." This assumption can backfire though because the Israeli operations have not discriminated between Hamas and the civilian population. Besides Hamas has had a track record of providing for the Gaza civilian population, and beleaguering Hamas might sway people to their side. Still, any peace process (or any ceasefire agreement or truce) would likely be pushed by the world community under the guidance of the new Obama administration, compelled by the horrors of the recent war. But any peace that ensues from such an agreement though may be short-lived, especially if the terms are overtly favoring one party over another. And as a new generation of Palestinians form, the cycle of violence may begin once more. A hefty price for strategizing toward the short-term gains.